A multi-atmosphere furnace with Super ER elements in the atmosphere. IN a further development of its concept of producing customised, furnace heating systems for specific and demanding applications, Kanthal AB has launched five new grades of Kanthal Super heating elements. The company recently launched several new products in its Superthal range of heating modules. Designed for use at very high temperatures, the key feature of the new Kanthal Super elements is that they work directly in the furnace atmosphere without muffles to protect them. Suitable for nitrogen, hydrogen, vacuum and mixtures of endogas and reducing furnace atmospheres, Kanthal Super elements are ready-made for use in production and laboratory furnaces in the glass, steel, electronics, ceramics and heat treatment industries. One new element, Kanthal Super ER offers the benefit of working in a range of different furnace atmospheres. 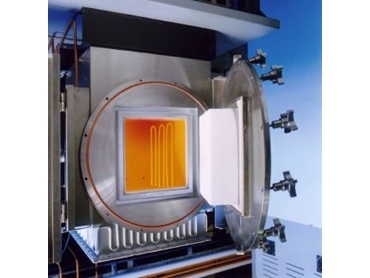 It is now possible, therefore, in one furnace, to operate firing cycles where the atmosphere condition can be altered, during the cycle, between oxidising, inert, endogas and reducing atmospheres. Suitable for temperatures up to 1600°C, Kanthal Super ER elements are equally suitable for oxidising processes. Another benefit is that they can be replaced, if necessary, whilst the furnace is hot, minimising downtime. The main applications are seen as most types of sintering furnaces working in reducing atmospheres such as dry hydrogen, nitrogen and endogas. Kanthal Super RA has been designed specially to work in nitrogen atmospheres at temperatures above 1250°C and to minimise the problems of element scaling caused by nitration. At temperatures above 1250°C in nitrogen atmospheres, the protective 'glaze' on elements is consumed, sometimes causing silicon nitride to be formed, leading to scaling. Kanthal Super RA withstands nitration at high temperature better than any other existing Kanthal Super element. Main applications are in different types of industrial furnace for heat treatment, forging and sintering. The third new element, Kanthal Super HT has outstanding high temperature properties in air or oxygen, cycling conditions. Its maximum operating temperature is 1830°C, making it suitable for laboratory and high temperature process furnaces. The special feature of Kanthal Super HT is much reduced and controlled growth of the oxide layer or 'glaze' which leads to a longer element life. Other properties include better hot strength and form stability. Designed for use in 'clean' process heating, up to 1800°C, in the research and electronic industries, Kanthal Super NC offers minimum scaling of the element surface. The metal content is also reduced which means less diffusion into the furnace atmosphere. Kanthal Super LC has an element configuration which creates a higher resistance than ordinary 'U' type elements. As a result, the power system can be designed for elements in series, connected directly to the line voltage and eliminating the need for transformers. Suitable for temperatures up to 1550°C in air/oxidising atmospheres, Kanthal Super LC can be used in most types of industrial furnace at an overall lower cost.